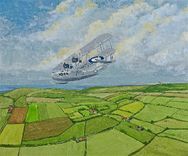 This Gouache painting depicts Edward Laine flying over Le Haut, St Saviours in Supermarine Southampton flying boat S-1058 of 201 Squadron RAF. Edward Laine was the first Guernseyman to go to RAF Training College, Cranwell. The affiliation between Guernsey and 201 Squadron was inaugurated in 1939, shortly before the Second World War, as a result of training flights to the island by aircraft such as this. The unusual aerial view in this painting gives us a rather disconcerting feeling of movement as the landscape falls away below us. 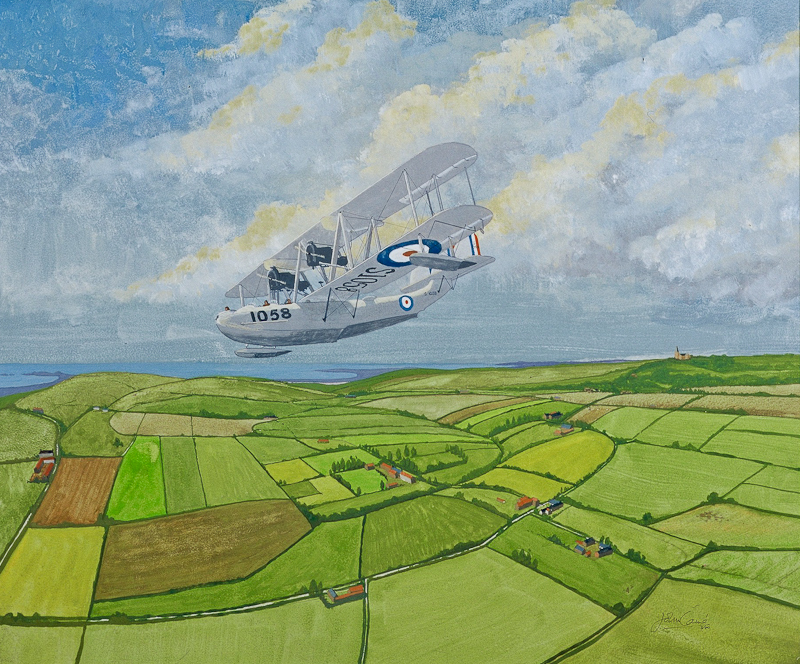 The patchwork of fields are distorted through the sheer height by which both the plane and the onlooker are viewing the landscape below.